MIANYANG, China, Oct. 27, 2018 /PRNewswire/ — Qinglian International Poetry Town, Jiangyou, Mianyang, Sichuan province, hosted the 2018 Sichuan International Cultural Tourism Festival and Jiangyou “One Belt, One Road” Li Bai Culture Festival (“the Two Festivals”) from October 24-26, 2018. Highlighting both international and domestic tourism sectors and with a focus on making tourism a better performing industry, the Two Festivals is an outstanding cultural tourism event showcasing Jiangyou’s local characteristics and traditions, which included an exhibition featuring the world’s intangible cultural heritages, a high-level forum on Li Bai Culture, the signing ceremony cementing the friendly relationship between Chinese and international tourism cities and a conference promoting Sichuan province as a cultural tourism destination. The event was attended by over 70 government officials from 20 countries, including the US, Russia, India, Germany, the Netherlands, Italy and Spain, as well as well-known Chinese and world culture and art experts and scholars, who were given an opportunity to observe local customs and get a better understanding of the economic and social development of the tech-driven town, where Li Bai, the greatest romantic poet of the Tang Dynasty, was born. a visit to the hometown of Li Bai by students and teachers from the Institute of South-South Cooperation and Development at Peking University. 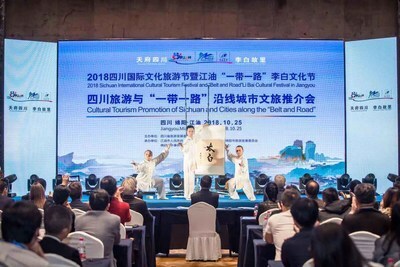 Also held was a conference aimed at promoting cultural tourism in Sichuan and in cities along the “One Belt, One Road”, where representatives from Sichuan, Mianyang and Jiangyou, as well as Numata, Japan and Valkenburg, the Netherlands, gave comprehensive presentations to promote their cities as cultural tourism destinations. In addition, a series of agreements to collaborate on and jointly invest in tourism-related projects were signed, with the aggregate investment reaching 10 billion yuan (approx. US$1.4 billion).